We have put together the list of the best LED TVs under Rs 25,000 for this month in India. Covering the top televisions from three sizes in this budget – 40 inch, 42-43 inch, and 50 inch, these televisions offer the best bang for your buck in this price segment. We’re only considering full HD televisions so you’ll find names such as LG and Samsung missing. Also, we’re only considering models in the price band of 20,000-25,000. 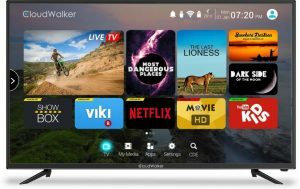 You can check the list of top TVs under Rs 20,000. for cheaper televisions in the same size, or, the best TVs under Rs 30,000 if something more premium is on your mind. Unfortunately, no 40-inch models between 20-25k. So here goes our list of top TVs under 25k for this month in India. Marq: Marq is Flipkart’s own brand of home appliances. While the brand is relatively new and chances are that much of the stuff they sell is imported from China, the reliability of the Flipkart brand name adds credence to this brand.